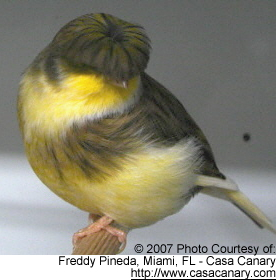 They are often confused with Crested Canaries. 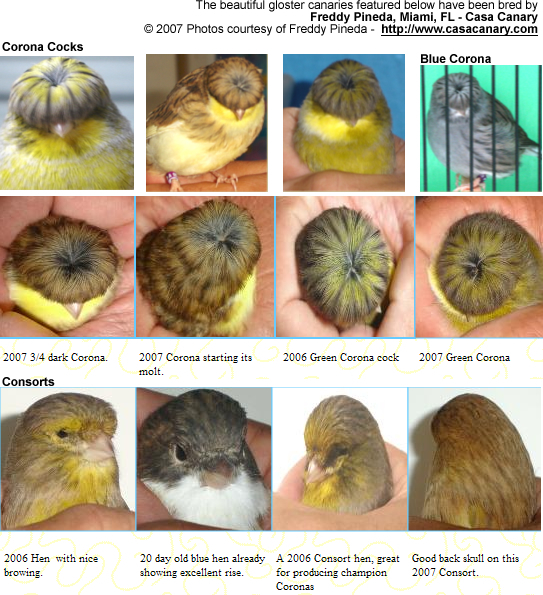 - although one noted difference is that crested canaries are larger than glosters and not as commonly available. 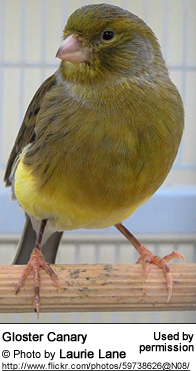 Although some Gloster canaries do sport cute "Beatles Haircuts" also referred to as "crests," the "crested canary" was recognized as a separate breed in 1925. Any crested Gloster is referred to as a Corona and those without crests (plainheads) are known as Consorts. Although a Type Canary (bred for their shape and conformation --and not bred for singing) --the Gloster is known to have a beautiful song. 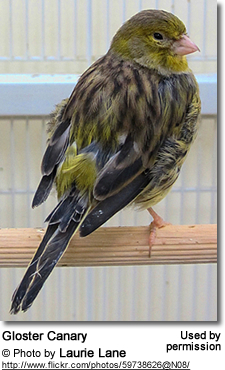 Their ability to sing and cute-looking crest has caused them to become very popular in aviculture and the pet trade. Breeders - Please Note: The gene that causes the crested mutation is dominant, but a double dose is lethal. 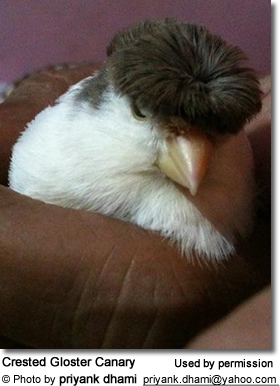 When one gene is inherited, the bird is crested. If two genes are inherited, then the bird's skull is deformed and the chick usually dies in shell. From the results below it can be seen that you will not get any more live crested chicks by breeding crested to crested, therefore this is not recommended (please refer to below). 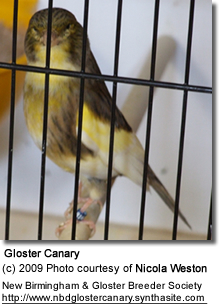 If you choose to breed your crested Gloster Canary, pair him or her up with a plain-headed Gloster Canary (Consort). Plainhead × Plainhead will produce 100% Plainhead young. Plainhead × Crested will produce 50% Plainhead and 50% Crested young. Crested × Crested will produce 25% Plainhead, 50% Crested, and 25% dead, NOT RECOMMENDED!